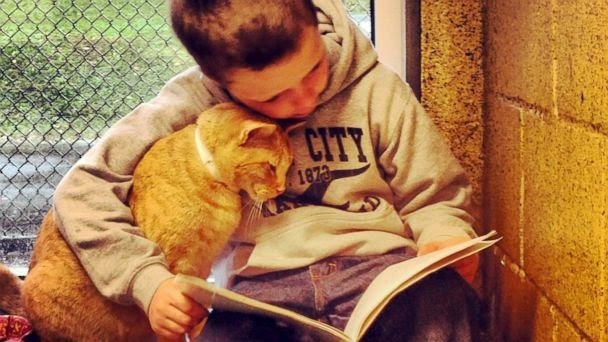 Kids and Cats become Book Buddies ~ Pawsitively Humane, Inc. This is one of the most clever, creative solutions to help both children with reading difficulty and pets that need "socialization" or just a regular companion. Colby Procyk, a seven year old, was reading below his grade level. With a new program, he visited the local animal shelter and would read to cats that were semi social or awaiting a home. By reading to them out loud, Colby's reading improved! The cats don't mind if he made a mistake and they are grateful for the company. That setting of ease and comfort raised his confidence. When we saw this on the news, we had to share it in hopes it will inspire county administrators at schools and animal shelters to team up! If there isn't time to volunteer regularly or disposable income to donate, you can help in other ways! This is but one easy example. Please take a moment to view and SHARE this link by writing to or emailing your school officials and animal shelters. Encourage them to start a dialogue and look into the possibilities of launching a similar program. It also helps raise awareness about proper pet care to reduce the number of homeless pets. It's a win-win solution!! [Please allow a minute for the video to download completely]. Ohhhh this soooooooooooooooo made me SMILE!!! Shared everywhere!!!!!!!!!!!!!!!!!!!!!! It's such a great idea--for everyone.